The bottom line of this blog is “Home-made fun and craft therapy” because I really believe crafts are good to keep us all happy and sane. Now is not the place to tell you how and when I found out. But the thing is I highly recommend any kind of crafting to everybody, even in small amount. Making something with my own hands, lovely materials and colours is one of my favourite things. But we all live busy lives, and it can be difficult to fit in some home-made time. That’s why today I want to share with you some tips to help making some space in your life for your favourite craft, whatever it is. The best way to be disappointed by a project is to fail because it was to big/complex/expensive to be realistic. 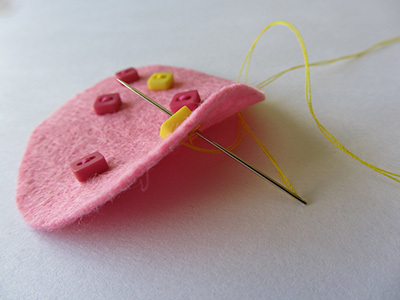 So if you’re new to crafting, start with short and easy projects. If you have only 20 minutes per week for your crafting, you would be able to complete a 1 hour project within 3 weeks. And you’ll see: once you have tasted the joys of making, you will magically find more time to accommodate your new passion. You don’t need to have a full 4 hours free time to start some craft project. As busy as you are, you may be able to spare 20 to 30 minutes here and there. Monitor yourself and find these gaps: do you need to spend all that time on the computer, does this television programme really require all your attention? Here is one of my guilty secrets: I would rather spend half an hour sewing than cleaning the kitchen floor. Make sure you store all your project supplies in a box you can take with you all around the house. Crafting in front of television or in bed before going to sleep are good options. I often find myself doing some knitting or hand sewing in the kitchen, waiting for pasta water to boil up or casserole to cook up in the oven. If you’re commuting, you can even pick some extra portable craft such as knitting or crochet and put your train time to profit. Here is the sad truth: it is as difficult to keep up with your craft time as with your relationship, especially if you have a job and/or children. So just use the same method for both: the weekly date. As far as crafting is concerned, pick a slot that works with your schedule and stick to it. Of course you need to make sure it is a time and day where you are fully awake and available for your crafty time, otherwise you won’t be able to stick to it. Fancy some company? Why not joining Creatives Unite, a community of crafty people run by Anna and crafting along every Thursday evening? Did you find these tips useful? 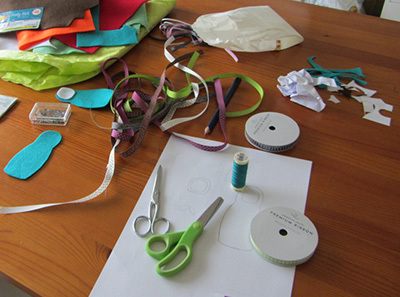 Do you have your own method to fit crafty time in your busy life? Previous Post La Creature Boutique is now open! Next Post Here you go: I’m a finalist! Thanks Anna for stopping by and commenting on this. I thought people would love to get some crafty company, that’s why I had added the link to Creatives Unite. I have now edited the article so it shows it is run by you. Thanks Raphaele for this interresting article! I craft infront of my TV as often as i can!! Knitting or felt sawing is the perfect activity to do at that time! Thanks again! Yep Sophie, I totally agree. Knitting and felt sewing are my two favourites too! Great post! I love creativesunite. It is amazing how powerful it is, being so informal! Great tips. Have shared on twitter. Thanks for your comment. I should try Creatives Unite as well, it seems so good. It is good and it works although I am not really sure why! Mum, aged 83, recently had a bad year with a nervous disability. Doctors, psychiatrists and drugs all tried but eventually she found cross stitch. A year on and she is not only better, but has also come to terms with the heart attack that started all mental problems! The only downside are the number of cross stitched cards she has made and the cost of the materials! Jan, this is a lovely story. It is amazing what needle craft can do for us. Happy to read your mum feels better. I have tweeted about the Etsy shop. It seems that having to focus on intricate stitches, and having to think about designs and colours enabled Mum to “block out” the (to us), irrational fears that were making her very unhappy and scared. She seemed to find a way forward as soon as she started her hobby. I’m hoping that maybe writing this gives family or friends ideas to use craft to help anyone they know with a nervous disability. Its very hard to understand the dark places the mind can take us, especially when on the “outside” as I was with Mum. Some great tips here. I have a four year old and a three month old and it’s so hard trying to find the time! It’s not helping that I have I change my craft room into a nursery in the next few months. I’m a cardmaker, but I find I only sit down to make them when I have a specific order. 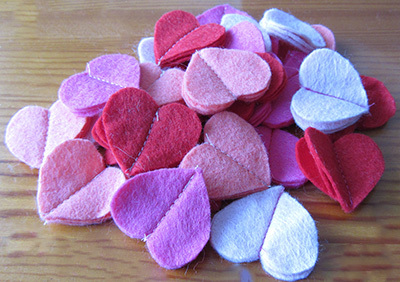 When i have a spare twenty minutes I might diecut some felt or stamp some flowers. Then when i get the chance to sit down, I have a lot of elements to work with. I suppose once the baby gets a bit older, it will be a little easier! I see where your are coming from Emma, and it is true that it will improve as the baby grows. However, they tend to hate when mum’s attention goes to craft, that is my experience at least. So I either try to involve them in some way or wait for them to be asleep 🙂 That’s a pity for your craft room. You are so right about little bits of time. Over the past many months cancer has affected our family and so my crafting time has been nil. I have so neglected my crafting space which has too much unused stuff bordering on hoarding. (Anyone else out there hoard craft supplies?) But I know that a few stitches here and a few stitches there eventually add up to a finished product. I like the portability factor. I ,too, believe that is part of the key. Gotta get back in the tiny time groove. Thanks for the kick. Hi Melanie, sorry to read what happened to your family. It surely affects your whole life, including time you can spare for crafting. I hope you can make some space for it because it is also good for cheering you up. Thanks Millie, very good tips, I love your post.